Fifty members representing ten West Midlands Area societies attended the Summer Special Interest Day. This was the first ‘roving’ event and was organised by The Arts Society Wrekin. Dr Tobias Capwell gave his presentation – Armour in Alabaster: Knightly Church Monuments of the late Middle Ages in Tong Church. The church has its origins in the 11th century and has an array of important early monuments. Toby delivered his ‘riveting’ talk from the pulpit with the screen set up amidst the monuments – where better? 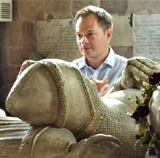 The lecture was most informative and included his research on 15th century effigies and the evidence for a distinct English style of armour – and the need to closely examine the rivets. The Tong PCC ladies put on an excellent lunch in the Parish Hall, after which participants travelled a short distance to Weston Park where Gareth Williams, the Curator, gave an enlightening and ‘highly polished’ talk on Chippendale’s Workshop. This was followed by guided tours of the house and then a delicious cream tea in the Orangery with freshly baked scones. The amazing weather ensured the day was a great success. The event generated a significant surplus as a result of the negotiation of very favourable terms for the expenses and a well-supported raffle. Donations of £471 each were given to Tong PCC towards new interpretation boards in the church and to Weston Park Foundation for educational purposes.